York was established in 1878 and provides affordable and reliable air conditioning systems. Berico, Carolina Fuels, and Alamance Oil can install and repair the York air conditioning systems. If you are considering York, call Berico today for a free in home energy audit to help you in your decision of which system is right for you. York builds air conditioners, furnaces and heat pumps for both residential and commercial customers. The York brand is known for being efficient at providing comfortable temperatures for affordable rates. Also, York has many different options to choose from when it comes to the types of air conditioning systems, furnaces and heat pumps that are right for your home or office. If you are interested in a unit with a cooling and heating efficiency that will provide you with the utmost comfort, this is a brand that to consider. York has been providing air conditioning systems for over 135 years. They are one of the few companies that offer split air conditioning systems. Of course, the type of system you choose will depend on where you plan to put the system and what your cooling system needs are. More than likely, you will be able to find a system from York, especially since they offer a wide variety. 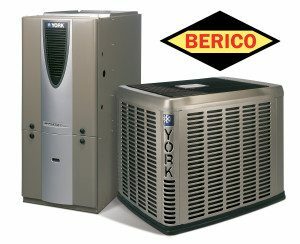 If you are having trouble with deciding on the right York unit for you, Berico can help by offering our professional advice and conduction a free home energy audit. Not only can we advise you on the best system for your needs, we will also install and maintain your chosen units. We have dedicated, experienced, and reliable technicians that are skilled in installing York air conditioning systems. Why try doing it yourself and risk doing it wrong when there are professionals who can make sure the job is done right the first time? Here at Berico, we know and understand the wants and needs of our customers when it comes to heating and cooling their homes and offices. We know that customers want to be able to enjoy comfortable temperatures year-round without spending a small fortune. This is why we offer comfort and protection service agreements. These agreements assure our customers that they will receive the installation of the air conditioning unit, along with any maintenance and repairs that will be needed in the future, all for an affordable price. Contact Berico today for more information on York systems, the installation process and how to save money with our comfort and protection service agreements. You can give us a call or visit our contact page to fill out a form or email us directly. We look forward to working with you.